For a music production beginner, a complicated drum machine can seem like a daunting and intimidating tool. Encouraging musical experimentation in novices and experts alike, product designer and Royal College of Art student Axel Bluhme created the XOXX Composer, an innovative interpretation of the standard drum machine. 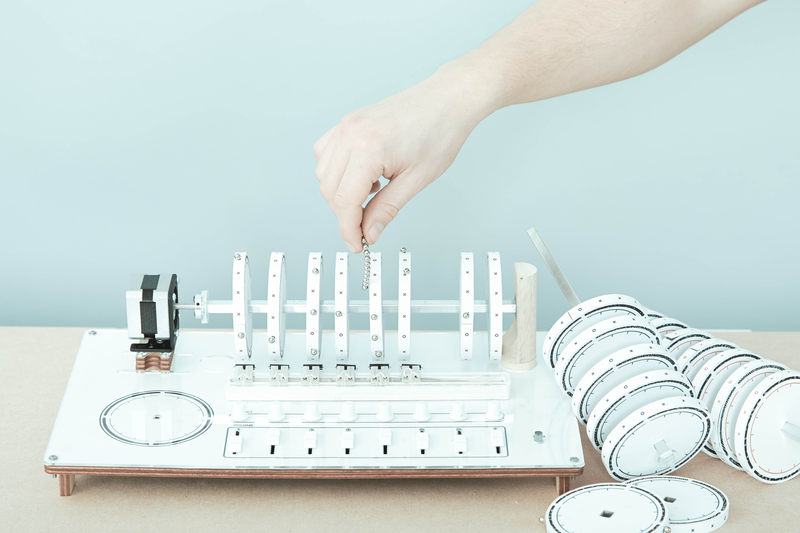 Resembling a kinetic sculpture, the XOXX Composer turns the drum machine’s largely digital interface into a tangible and accessible physical object. In order to learn more about the XOXX Composer, the 10,000 spoke with Bluhme from London about the inspiration behind his design, how the machine works and the overwhelmingly positive responses he has received. Bluhme developed the XOXX Composer‘s concept after personally experiencing a steep learning curve while trying to use a Korg Volca drum machine. “I began thinking about how people start making music. A lot of people lack the confidence when engaging with something new. I wanted to make it more cognitive, tangible and tacit,” recalls Bluhme. Built for all skill levels, the XOXX Composer features eight rotating discs that can store and layer eight different samples. Each disc is then divided into four bars and sixteen steps, which are demarcated by X’s and O’s that also give the machine its name. In order to trigger the sounds, the user places magnets on any of the steps, allowing for various levels of sonic complexity.